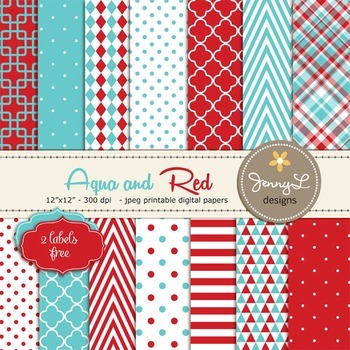 These Aqua Blue and Red Digital Papers, Red and Turquoise Digital Paper are ideal for creating various art projects, classroom decors, teaching materials, digital scrapbooking, making invitations, other creative fun projects at school or home. ~Printed products may vary in color due to differences in computer monitors, printers and quality of papers used. JennyL Designs Shop will not be responsible for the resulting color variations due to diff. factors involved.